This confession led to many readers admitting they never donate yarn either, as well as many other readers telling me exactly when and where they donated yarn. My heart was gladdened to learn that not only am I not alone, but also that many others were more than making up for my failings by their generosity. She went on to tell me that she had her own special pattern for a hat for charity that she would be willing to share with me and my readers, if I so desired. Of course, I very much did! I hope by now you’re really eager for this pattern! Here it is. Note: if you’ve seen this pattern before August 10, 2017, a correction has been made to the tuck stitch rounds. Round 6 should end with a k 4 down, and round 11 should end with k2. 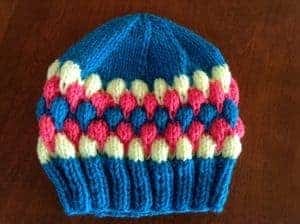 This hat for charity features knitted rounds of stockinette stitch with one row of tuck stitches that incorporates a color change and adds texture. knit 4 down by unraveling st down 4 rds, inserting right needle in the front of the 5th st and knit, capturing the 4 unraveled rds behind the stitch. Mark the beginning of the round. Join in the round, making sure the cast on sts don’t twist. Work rib pattern of k2, p2 for 8 to 10 rds, or approximately 1 1/2″ to 2″. 2. Switch to color B. 3. Switch to color C.
Round 6: K3, *knit 4 down, K3, repeat from * to last stitch, k 4 down. 4. Switch to color A. Round 11: K1, *k 4 down, K3, repeat from * to last 2 stitches, k2. 5. Switch to color C.
Knit rounds of stockinette until piece measures 6 to 7 1/2″ from cast-on edge. Alternating rows of the tuck stitch gave this single color infant hat depth and texture. Continue dec rds in this manner until 8 stitches remain. Draw yarn through final 8 sts and weave in the ends. Huge thanks to Ginny for a wonderful hat pattern. What do you think? What might you use this particular pattern for? 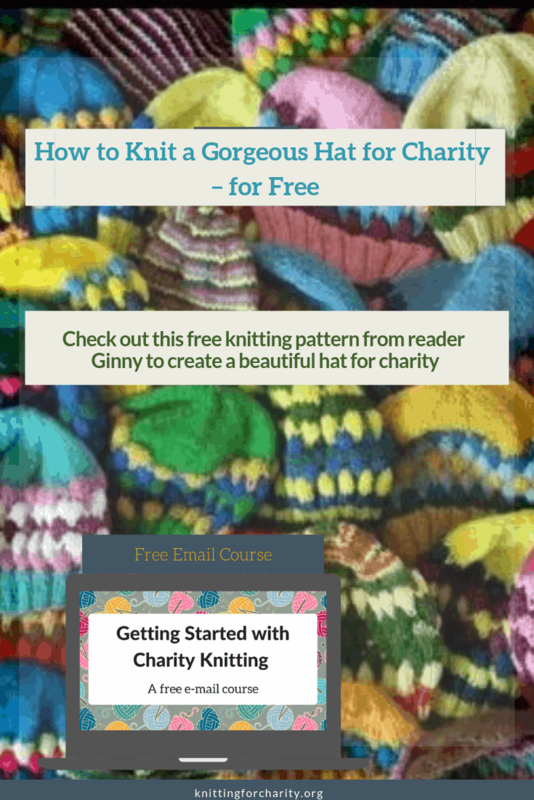 For more fabulous free hat knitting patterns, take a look at the Hats Category of my Free Knitting Patterns! Hi Chris! I’ve just sent a note to Ginny asking her. I’ll get back to you as soon as I find out! This is such a sweet hat. Im casting on today. I’m math challenged. After this one, I’d like to make it in different kinds of yarn to use up my stash. Would I increase (or decrease) in multiples of four? Thanks! Hi Ludmilla! Yes, the best way to make different sizes would be to increase or decrease in multiples of four. Good luck! I have never used dpn’s before, nor have I ever made the tuck stitch. I checked youtube for the tutorial on the tuck stitch, okay, got it down pat! This makes a very attractive hat! I can’t wait to make some of these hats now, and will take them to a local charity here where I live. Thanks to Ginny Jovanovich for the great pattern. Thanks to Knitting for Charity for always providing us with patterns and encouraging us to help take care of others who are in need! You all ROCK! Hi. I really want to make some hats with this pattern but I’m confused. If you cast on 72 sts, then on Round 6 you Knit 3, leaving 69 sts left , followed by “Tuck stitch, then K3) which is a multiple of 4. 4 doesn’t go evenly into 69. On Round 11, it’s K1, leaving 71 sts, then “Tuck st, K3” which is again a multiple of 4, which doesn’t go evenly into 71. I can’t figure out how to make this work — am clearly missing something. Would appreciate clarification. Can’t wait to make the pattern. Hi Kathryn! As it happens, another reader has also caught this problem, and I’ve passed it along to Ginny. She promises she’ll take a look at the pattern in the morning and try to figure out where she (or I, in transcribing her pattern!) might have made an error. So if you can hang on till tomorrow, we should get a fix taken care of. Thanks! Thanks for your patience, Kathryn. The pattern has been corrected above. Round 6 ends with a k 4 down, and round 11 ends with a k2. Hope that helps! Thanks so much for the correction; I’m ready to start the hat now … such an adorable pattern! You’re welcome, Kathryn. I’m chomping at the bit to try it now, lol. I knitted a little swatch when I was trying to help Ginny figure out a correction, and it was so much fun that I really want to knit the whole hat now! Fantastic hat pattern! Makes me want to get my needles out! I bet the different colors and small size of the project make it interesting. It’s a great feeling to make things for people in need. Those are exactly the reasons I’m eager to give this pattern a try, Tamara! 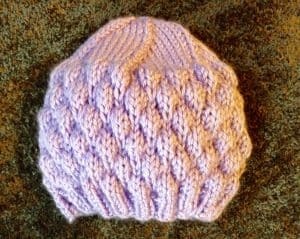 Nicole, thank you for posting this hat pattern- it’s a beauty! Also: I hope Lynda Harrison will share with us how we can also knit for the Native American children at the school in North Dakota. This is exactly the kind of project I want to beinvolved in. You’re welcome, Anita! I agree, such a beautiful pattern. And I too am hoping Lynda shares with us! I bet the tuck stitches also give it great insulating properties, with the bit of extra air they hold! And somehow, they just look more interesting and special than ordinary stripes, with barely any additional effort. I’d love to use this for a kids’ charity when I get around to it. 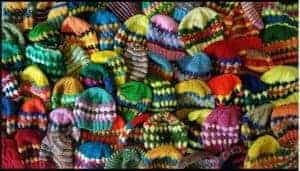 The wonderful photo of 60 hats shows just how versatile it is for different recipients, no matter what kind of colour scheme — some look “frilly” and some look “funky” all with the same pattern. Very nice! I suspect you’re right about the insulating properties, Carol. And I too love that added interest and uniqueness. It reminds me a bit of entrelac. I can’t wait to try this out myself. I’m so thankful to Ginny for sharing the pattern with me and allowing me to share it with all of you! I use up my left-over yarn (plus yarn I go and purchase specifically for this project) by making hats, scarves, and sweaters which are sent to a school for Native American children in the Dakotas. I usually make at least 100 hats of varying sizes each year. How fabulous! Do you have a specific organization you send them to? What a wonderful thing to do. Hi Nicole, the items I make are sent to St. Joseph’s Indian School in Chamberlain, South Dakota. Thank-you very much for your comments. I started knitting when I was 15 and have indulged my love for the craft ever since. I was at a loss to know what I could do as I had made just about all the sweaters, etc. that my family could ever use and my husband suggested making for the children at St. Joseph’s.